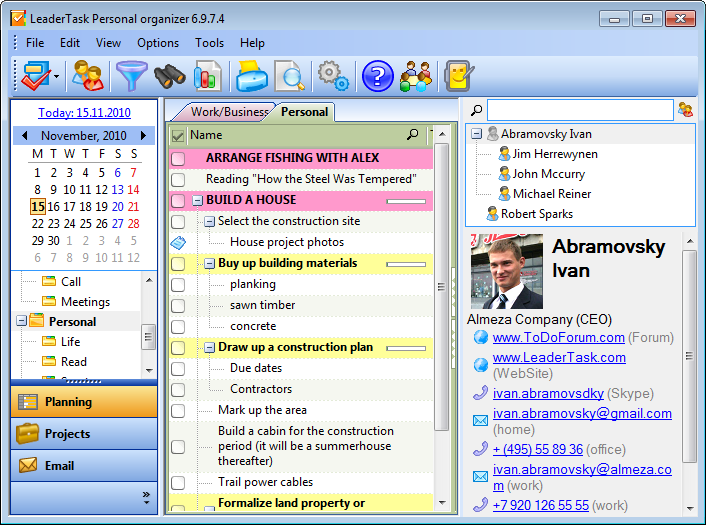 Projects - The "Projects" section in the LeaderTask organizer will help you organize efficient work in your real projects! Every project has its deadline, executor, aim and comment. Reminders - The systems of reminders will not let you forget about upcoming important events: birthdays, appointments, important issues. LeaderTask will automatically keep reminding you about upcoming events and you will also be able to set a reminder for the necessary time manually. Priorities - LeaderTask allows you to specify your own set of priorities and their visual display. For example, "Important" tasks will be highlighted in red and have only uppercase letters in them, tasks with the "Urgent!" priority will be highlighted in yellow and underlined and so on. Qweas is providing links to LeaderTask 7.3.5.1 as a courtesy, and makes no representations regarding LeaderTask or any other applications or any information related thereto. Any questions, complaints or claims regarding this application LeaderTask 7.3.5.1 must be directed to the appropriate software vendor. You may click the publisher link of LeaderTask on the top of this page to get more details about the vendor.